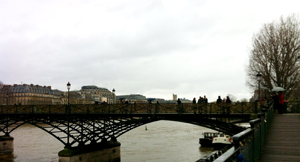 Home » Bridges » What To Do About Love Locks on the Pont des Arts? News out of Paris during the last few days is that the preponderance of padlocks attached to the Pont des Arts—a cultural phenomenon known as “love locks,” in which a couple inscribes their names on a lock, attaches it to the bridge, and throws the key into the Seine, symbolizing their eternal love—caused part of the bridge to collapse. Engineers closed the Pont des Arts for a few hours to assess the damage, and to place wooden barriers on the sides where the metal grates fell off into the river below. Fortunately, no one was hurt by the falling metal, which is something of a miracle considering the constant flow of tourist boats under the bridge both night and day. 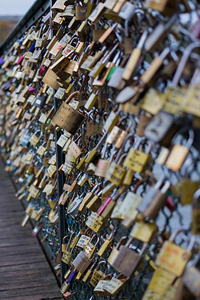 Parisians—and visitors alike—have strong feelings about the love locks. Some love them, some detest them. (I’m in the former category, with a few caveats.) But the issue is now clear—something needs to be done before people get hurt or the bridge itself suffers irreparable damage. First, though, a little history on the Pont des Arts. The pedestrian-only bridge that connects the Institut de France on the Left Bank with the Louvre on the Right Bank was built from 1981 to 1984 to replace a 19th century pedestrian bridge that had been damaged during World Wars I and II and which partially collapses after being rammed by a barge on the Seine in 1979. Today, the Pont des Arts (Metro: Pont Neuf) frequently serves as an open-air art gallery for both official exhibits and displays by amateur artists. It’s also a popular spot for sketching and painting, particularly for art students, due to its vistas of the Seine, the Louvre and the Ile de la Cite. The love locks phenomenon on the bridge took off after the turn of the century, although the practice was first described more than 100 years ago in a Serbian novel and focused on the Most Ljubavi in the town of Vrnjacka Banja, Serbia. The placing of love locks became a Europe-wide practice following its depiction in the 2006 Italian teen romance novel “Ho Voglia di Te (I Want You)” which was made into a movie the following year. 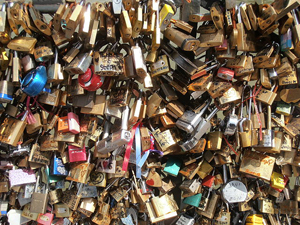 So, what should be done about the love locks phenomenon in Paris? And banning the practice on the Pont des Arts is only going to lead to its explosion elsewhere. Many other Parisian bridges—and even some landmarks, like the Eiffel Tower—are already reporting the appearance of love locks. This is a shame. No one—even fans of the love locks—want them to be attached to every bridge, monument and sight-seeing destination in the city. So, why not this? Reinforce the sides of the Pont des Arts so they can withstand the weight of the additional locks—and not collapse into the Seine below. Make the bridge the “official” location where visitors and locals alike can place love their locks. City workers can remove the grates filled with locks on a rotating basis so that new, empty grates are constantly going up. Old locks and grates are recycled. And the practice is banned at other sites in the city. Locks placed there are routinely cut off. 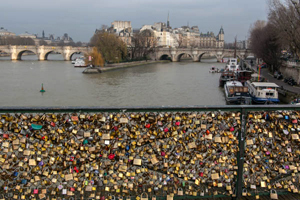 Sure, it won’t stop folks from trying elsewhere, but it will keep the masses focused on the Pont des Arts. Besides, who wants to hang a lock elsewhere when the “Love Bridge” is the true place for them—and is openly promoted as such? Who will pay for the upkeep and maintenance? Why not have the city itself sell locks (even specially designed ones that weigh less than hardware-store varieties) at kiosks at either end of the bridge, with profits (even a tax?) used to fund the necessary upkeep? That’s my two centimes, at any rate. I really do think the genie is out of the bottle on this phenomenon. It’s not going to go away, no matter how much opponents wish it would. The best we can hope for at this point is a solution that appeases those who are determined to leave behind their love locks in Paris and those who want the practice contained or, at the very least, made safer. I hope they find a safe way to keep the love locks. 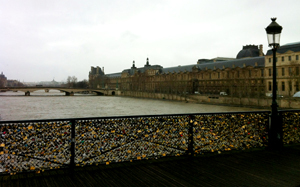 This entry was posted in Bridges, Sight-seeing and tagged love locks, Pont des Arts by Bob Adams. Bookmark the permalink.